Looking for the best ever fluffy American pancake recipe? Look no further! This foolproof recipe will give you perfect pancakes every single time. A fair amount of people have been asking for my pancake recipe recently. This is the recipe I make almost every weekend with my boys. Now I’m not in the habit of saying recipes are “the best”, but I’m making an exception for these pancakes. I do believe they are the best pancake recipe ever. Well, let’s just say they are the best I’ve ever tried! Plus my boys say they are the best, so I’m going with it. They are like the kind of pancakes I imagine are served in American diners – really thick, fluffy and they smell amazing. I can eat far too many of them than I care to admit! I love these pancakes with blueberries (see my pancakes with blueberry and orange syrup) and maple or golden syrup. 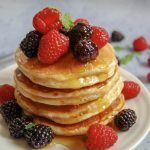 My kids love Nutella – funnily enough they are also crazy for these Nutella stuffed pancakes -or simply spread with butter and strawberry jam. Just a quick note…if you have taken complete leave of your senses and find yourself hosting a sleepover for 6+ children you may want to double the recipe. I am speaking from experience! This post was originally published 2nd August 2012. Re-published with new photographs 15th February 2019. Enough milk to make a thick-ish batter I'm afraid I don't measure the milk so it's difficult for me to give a measurement, but I would say it's around 300ml. I just add a good splash and whisk, then add some more until I get the right consistency. Heat a girdle (griddle in America) or frying pan. Sift the flour and baking powder in a large bowl. Crack the eggs into a separate bowl and pour in the sugar, oil and vanilla. Beat well until the sugar has dissolved. Add this mixture to the dry ingredients and stir. Add enough milk to make a thick batter. Your griddle or frying pan should now be nice and hot. Smear it with a little butter and drop in spoonfuls of the mixture (I use an American 1/4 cup.) When bubbles appear on the surface, flip over and cook for another minute or two. you can use buttermilk in place of the milk, if you like. Mmmmmmmm…a great start to any weekend. I’ll always remember pancakes with homemade jam & “Nannie’s nice butter”!! Oh you know I love pancakes! Especially with blueberries!! No sleepovers here though! Two boys is plenty. I think I agree with you there Heather…two boys is definitely enough! I still remember the sleepover we had with six boys…carnage! Hi NY! I saw the picture on FB, so glad you made these and enjoyed them! 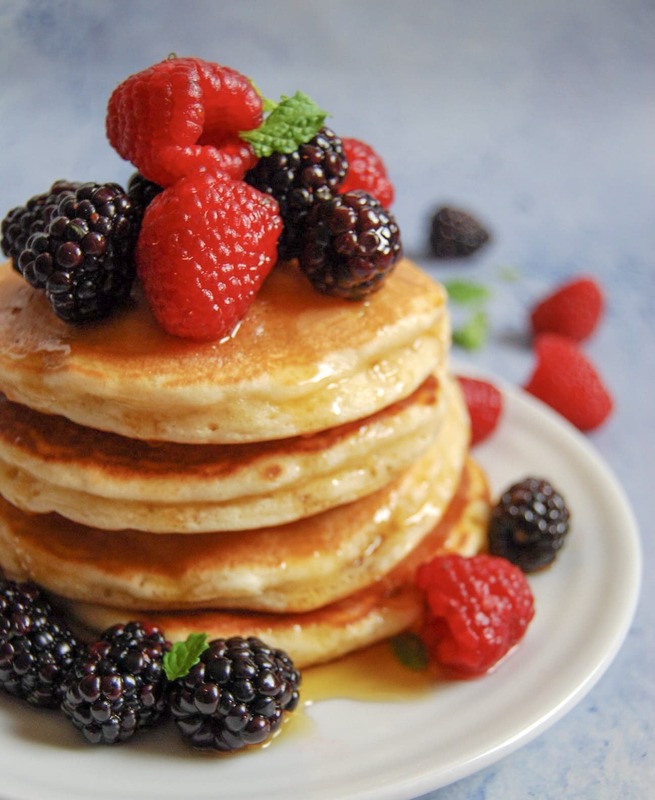 Thanks for sharing your recipe – I’ve been wanting to make blueberry pancakes like this for ever! 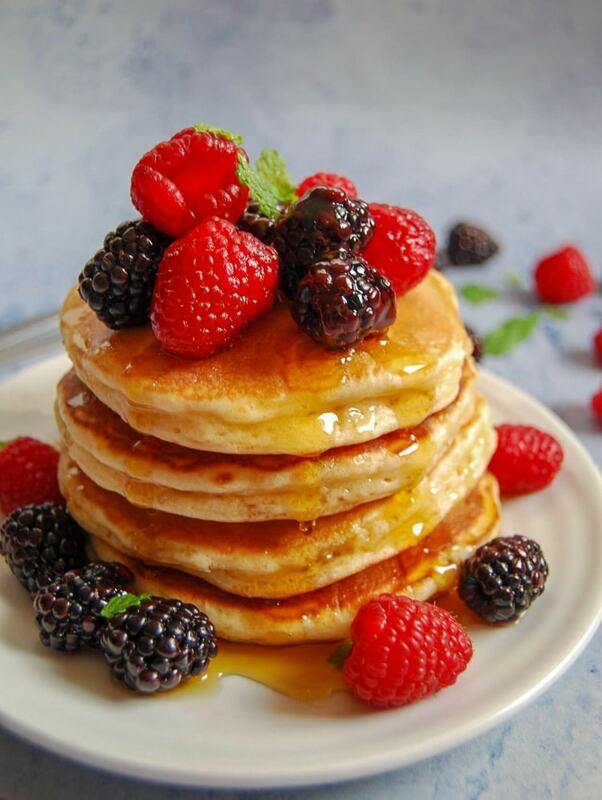 I love how thick and fluffy your pancakes look! Interestingly, I’ve never tried pancakes with Nutella … I think your boys might be onto something good here! I did half the quantity, made 6 but with a little batter over, the potential for one or two more. So, 3 this morning & the others tomorrow. 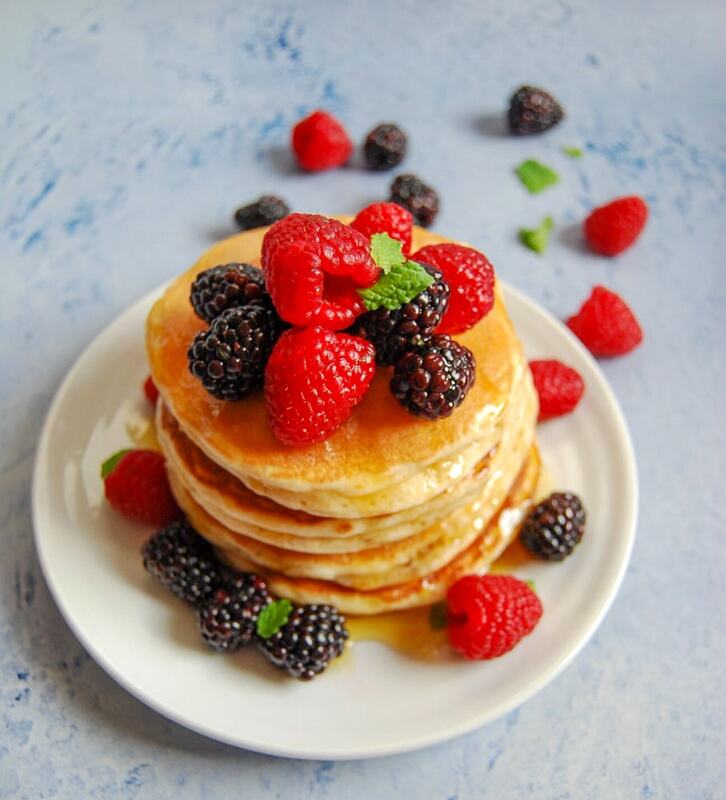 Easy to follow recipe that produces gorgeous pancakes!